Start a new Jaguar question. 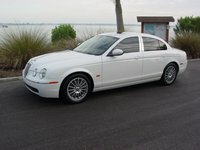 Servicing Jaguar XJ - Do I HAVE To Take It To Dealer? BATTERY COVER LATCHED? OR STUCK? It's actually pronounced Jag-yu-are. This very prestigious British automaker commenced production under the name SS Cars Limited in 1922. After the fall of Nazi Germany, the SS named was dropped, clearly for public relations purposes. The name "Jaguar", which had previously been an SS model, was applied to the entire make. The company has changed hands several times since, finally becoming a Ford subsidiary in 1990. Ownership of Jaguar may be changing again soon. In the early 1950s, Jaguar began importing to the United States. Initial offerings included the XK 140 and XK 150 sports cars, as well as the Mark VII and Mark VIII saloons. Jaguar popularity was bolstered by the British invasion of the 1960s, and attractive new models like the XK-E quickly rose to prominence. By the early 1970s, Jaguar was well established in the United States, and the arrival of the new XJ sedan series dramatically elevated sales. Many describe Jaguar ownership in terms of a love/hate relationship. All models are beautiful and luxurious, but day to day driving can lead to frustration. For decades, Jaguar has been plagued by reliability and build quality issues. Ford's oversight has alleviated some of the more ridiculous mishaps. Despite such problems, the Jaguar is quite enticing for most luxury car shoppers. The sleek and athletic exterior designs are complemented by by an equally attractive cabin. Regardless of the model, the Jaguar interior is filled with soft leather, polished wood inlays, and just about every luxury and convenience feature available at the time of production. For many drivers, the fine blend of luxury and performance has been enough to overlook some, okay many, mechanical and electrical shortcomings.